Most modern people get an idea about corsets from films like ‘Gone with the Wind` and others. It shows Victorian women holding tight while their maid pulls at the corset strings to achieve the best and highly restrictive tiny waist. Just like today’s women who go for a plastic surgery or wear really high heels to look good, Victorian women also took efforts for the sake of fashion. Large crinolines, protruding bustles and heavily boned corsets were causing movement to restrict, limiting their activities. With advanced machinary in the late 19th and early 20th century, underwear with new designs oftend helped women. Comfort, health and partaking in sports resulted in women becoming more aware of their bodies and the tight underwears. The corsets were popularized for the very first time in the 16th century. The use of corsets then was to only improve the shape of the bust and not narrow the waist. The early corsets for daily use were hand-made and required many layers of linen and heavy fabric to make it stiff. In mid-1800, boning became popular with the introduction of a sewing machine. A corset was an important undergarment which was designed in such a manner so as to improve the female figure. Corsets laced up the center-back of the woman to give it the right amount of tightness required. This was also known as tight-lacing. It is essential to note that corsets were always worn over a cotton chemise and did not directly touch the skin. Corsets were worn by women, young girls and children. Young girls and child wore corsets as their clothes were similar to the type of clothes worn by the adults in the family. Corsets were worn by young girls to enable them to get the right posture. The women of the Victorian period were expected to be married and take care of her husband and children. Clothing formed an essential part of the Victorian society. A woman of upper-class had servants to do all the chores while the women of lower classes were required to do the work. Tightly laced corsets closely-fitted clothes meant that the woman belongs to the upper-class. On the other hand, bulges and rolls on the body indicated that the woman is from lower-class. There was a variety in types of corsets that were available. With the Victorian women venturing into male dominated sports activities, different corsets were introduced to suit the sportswear. 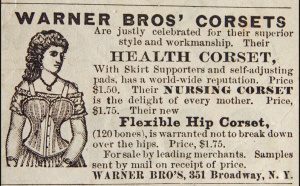 Abdominal corsets were available for pregnant women. 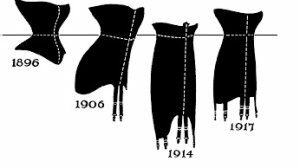 In 1830 the corsets reappeared and were useful for giving the torso a proper shape by narrowing the waist and supporting the breasts. In the 19th century, it was a fashion to have an hour-glass figure which was possible after reducing the waistline by using a corset. The new corsets were different from the previous ones. The new type of corsets ended some inches below the waist. The invention of the sewing machine enabled the manufacturers to produce more variety of corsets. The sewing machine reduced the hard work required for making a hand-made corset. In the early 1860s, manufactured corsets were sprayed with vegetable starch and then placed into iron maidens. Infertility due to very tight corsets. Continued miscarriages with many remaining sterile for life. A pregnant woman wearing such a corset means they could lose their baby. Possibility of babies coming out deformed. Faintsing caused by sunstroke or by the difficult task of breathing well. With so many above costs, only reason women wanted to wear corsets was to enhance her figure and to enhance her bust as well. Whether it was worth it is anybody’s guess.